Brian Switek and Julius Costonyi are some of the best people at what they do. Brian being a passionate writer of things dealing with the field of paleontology and Julius being an absolutely gifted artist. I’ve had the pleasure and honor of meeting both of these gentlemen over the years, as well as working with Brian in the field at the Burpee Museum‘s Utah dig site in 2014. When I found out earlier this year that they had collaborated together on a book I was ecstatic and knew right away that, children’s book or not, it would be something worth picking up. Finally, I was able to get my hands on a copy of Prehistoric Predators! Now, judging from the cover one might assume that the book may only deal with predators of the Mesozoic- which is not the case at all. This book actually has five chapters: Permian, Triassic, Jurassic, Cretaceous, and Cenozoic. The book begins with a great introduction, explaining briefly the history of predatory animals on earth as well as giving us a nice breakdown of the periods on the right hand side (and when dealing with the Cenozoic it even goes down to the Epochs, a pretty rare and welcomed addition for a children’s book!) All of the periods and epochs have year ranges associated with them so that when you read the rest of the text a nd, for example, you see that Linheraptor lived between 84 and 75 million years ago you can flip to this key and pin point the period that it would belong to. This book highlights over 40 different predators, but there are far more animals included in this text (come on, you can’t have a book about predators without including their prey!) Each chapter opens up with a description of what is going on during this time in history- how the earth is changing, what new species are evolving, notable extinctions, etc. The meat of the book are the species highlights. In general it is laid out like an average guide book to the various species. You get the name, followed by how you pronounce it, the age of the creature, a physical description, and ending with a little “Scientific Bite”- a kind of blurb or random bit of information about the creature. Accompanying the facts of the creatures there is also usually a paragraph describing the illustration on the page: what is happening, and what exactly you are seeing. They also include information on current knowledge about the species you are looking at. While at first glance you may think that this book is set up like most other children’s dinosaur books, it isn’t. The small picture accompanying discretion tend to offer a lot of valuable information on current research and theories in the field of paleontology. Also another MAJOR inclusion is the fact that all of the highlighted animals have their species name! This is something that is hardly ever in children’s dinosaur books! When I was younger I would have given anything for a book to include the species names. It’s a great addition, and one I’m glad they put in. It’s one of the main things, for me, that really helps separate this book from others like it on the market. They unfortunately don’t include the scientific in the pronunciation part on each fact bubble, but that’s only a minor complaint. Within each chapter there is a great range of animals from each time period. We obviously are going to get well known animals like Velocriaptor, Spinosaurus, and Tyrannosaurus rex (seriously, it’s pretty much sacrilegious to not include that trifecta now in nearly any dinosaur book.) But there is also a great array of animals not commonly presented. Animals like Eocarcharia, Masiakasaurus, and Guanlong get some really good pages in this book- among many others. Also, Therizinosaurus gets a page in this book- in a “predators” book! I think that’s so awesome. because it’s often not clumped together with theropods because the common thinking is that they are omnivores/mainly herbivores (it was completely skipped in my dinosaur class in college because of that reason.) I don’t know, maybe authors tend to think it’s hard to discribe a theropod that isn’t strickly a carnivore. Not Switek though. He and Csotonyi present it like a pair of bosses and then continues on with the book. I love the fact that it’s included in this text. While the information presented is absolutely fantastic, the artwork is the real selling point. Julius Csotonyi’s artwork jumps off the pages at you to give you goosebumps. He presents all of the prehistoric animals in this book with such life that sometimes you swear you’re looking at a photo. All at the same time he’s including current scientific theories about each of these animals as well as his own artistic spin. These images are so detailed that you could spend countless time looking at one of the landscapes and still be catching new details. The images are incredibly dynamic, and full of atmosphere and emotion. The Dimetrodon with a ripped sail. The Suchomimus fishing. The Giganotosaurus. The Deltadromeus. All of these are so rich in how they are presenting individual stories, it’s breathtaking. And good God I need a mural of that Jurassic storm scene with the Allosaurus and Stegosaurus. It’s one of the most amazing things I’ve ever seen. While there are no flaws at all in the artwork (or really in this book at all for that matter) I do think it’s interesting to note that on the introduction page we get a great image of a Tyrannosaurus rex. If you turn to page 63 in the book you can see that the same base image was used to make the Daspletosaurus. Not a critique at all, in fact it’s pretty common for this kind of thing to pop up in books. Artwork gets edited, and refined. Besides, T. rex and Daspletosaurus are related and look similar. It’s not like they took a rex and added a sail to it and called it Spinosaurus. 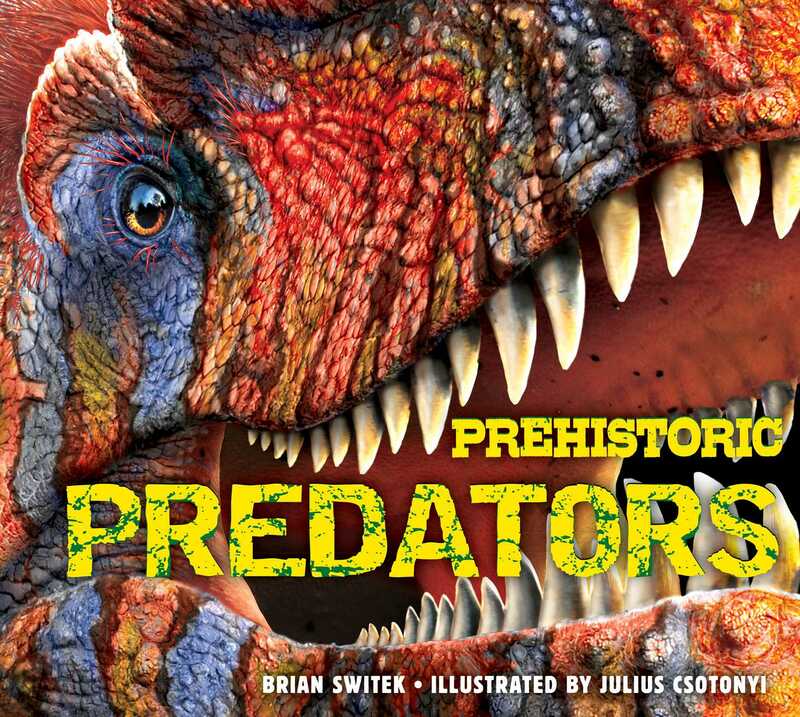 Overall Prehistoric Predators is an incredible book with some great information, and amazing artwork. It lacks a lot of the more graphic scenes you come to expect in a lot of predatory based dinosaur books (even for kids,) and the information is easy to read and comprehend- making it a great book for younger dinosaur enthusiasts. While older paleo-lovers may want a little more on the side of reading and facts, they are sure to be thrilled with what in-depth information is there, the inclusion of some lesser known prehistoric animals, as well as they very inspiring art work. It’s a great book for ages young and old, and defiantly worth getting at first sight! Prehistoric Predators is published by Applesauce Press and is available online and in book stores now, with a list price of $19.95.